代雅然, 张嘉玮, 彭松柏, 叶太平, 王敏, 戴传固, 张慧, 陈建书. 贵州梵净山地区新元古代拉伸纪岩浆演化时序[J]. 地质通报, 2019, 38(2-3): 360-370. 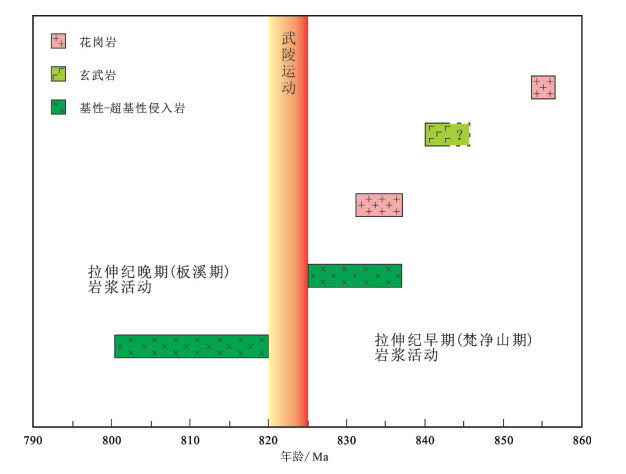 Dai Y R, Zhang J W, Peng S B, Ye T P, Wang M, Dai C G, Zhang H, Chen J S. Geochronologic sequence of Neoproterozoic Tonian magmatism in Fanjingshan area, xiuning Country, Guizhou Province[J]. 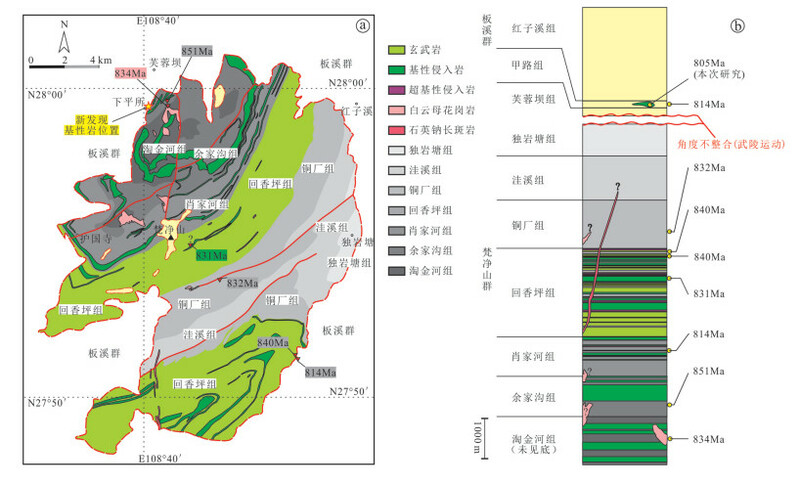 Geological Bulletin of China, 2019, 38(2-3): 360-370. Abstract: In order to obtain the geochronologic sequence of the Neoproterozoic magmatism in Fanjingshan area of the western Jiangnan Orogen and to provide a reliable foundation of chronological study in the typical area for comprehensive comparison and for geopark declaration and science popularization, the paper reports the zircon U-Pb dating of a newly discovered diabase in Fanjingshan area. The result shows that the diabase was formed at 805.3±4.5Ma. The authors also sorted and summarized the existing age reports in a comprehensive and systematic way, and hold that the end of the eruption of basalts was 840Ma. There were two periods of basic-ultrabasic magmatism (831Ma, 814~805Ma) and two periods of acid magmatism (855Ma, 834Ma) that occurred in Fanjingshan area during Neoproterozoic. The magmatic geochronology sequence of Fanjingshan area largely corresponds to that of southwest Guizhou-north Guangxi area. Combined with rock types and its geochemical features, it is implied that the Neoproterozoic Early Tonian magmatic rocks in western part of Jiangnan Orogen were formed by the subduction-collision process of Yangtze and Cathaysia blocks, and the Late Tonian magmatic rocks were formed by the rifting process of South China Craton. Zhang S B, Wu R X, Zheng Y F. Neoproterozoic continental accretion in South China:geochemical evidence from the Fuchuan ophiolite in the Jiangnan orogen[J]. Precambrian Research, 2012, 220: 45-64. 覃永军, 杜远生, 牟军, 等. 黔东南地区新元古代下江群的地层年代及其地质意义[J]. 地球科学, 2015, 40: 1107-1120. 崔晓庄, 江新胜, 邓奇, 等. 桂北地区丹洲群锆石U-Pb年代学及对华南新元古代裂谷作用期次的启示[J]. 大地构造与成矿学, 2016, 154: 1049-1063. 王敏, 戴传固, 陈建书, 等. 贵州省梵净山区新元古代岩浆活动的年代学格架及其大地构造意义[J]. 中国地质, 2016, 43: 843-856. 王敏, 戴传固, 王雪华, 等. 贵州梵净山群沉积时代——来自原位锆石U-Pb测年证据[J]. 岩石矿物学杂志, 2012, 31: 843-857. Zhao J H, Zhou M F, Yan D P, et al. Reappraisal of the ages of Neoproterozoic strata in South China:No connection with the Grenvillian orogeny[J]. Geology, 2011, 34: 299-302. 张传恒, 高林志, 史晓颖, 等. 梵净山群火山岩锆石SHRIMP年龄及其年代地层学意义[J]. 地学前缘, 2014, 21: 139-143. 王敏, 戴传固, 王雪华, 等. 贵州梵净山白云母花岗岩锆石年代、铪同位素及对华南地壳生长的制约[J]. 地学前缘, 2011, 18: 213-223. 高林志, 戴传固, 丁孝忠, 等. 侵入梵净山群白岗岩锆石U-Pb年龄及白岗岩底砾岩对下江群沉积的制约[J]. 中国地质, 2011, 38: 1413-1420. 高林志, 戴传固, 刘燕学, 等. 黔东地区下江群凝灰岩锆石SHRIMP U-Pb年龄及其地层意义[J]. 中国地质, 2010, 37(4): 1071-1080. 薛怀民, 马芳, 宋永勤. 江南造山带西南段梵净山地区镁铁质-超镁铁质岩:形成时代、地球化学特征与构造环境[J]. 岩石学报, 2012, 28: 3015-3030. Ludwig K R, ISOPLOT 3. 0:A Geochronological Toolkit for Microsoft Excel[J]. Berkeley Geochronology Center Special Publication, 2003, 4: 1-71.